Srila Rupa Goswami, one of the six Goswamis of Vrindavana, was an incarnation of Rupa Manjari, the most important of the eight confidential maidservants of Srimati Radharani in the eternal transcendental Vrindavana. It is said that without taking shelter of Rupa Gosvami one cannot enter into the pastimes of Lord Caitanya, and without taking shelter of Rupa Manjari one cannot enter into the confidential loving pastimes of Sri Sri Radha Krishna. Srila Rupa Goswami’s lineage can be traced back to Karnataka, South India where his Sarasvata brahmana descendants held influential positions. Rupa Gosvami’s nephew, Jiva Gosvami has explained in his Laghu Toshani that Rupa’s descendants were of the Bharadvaja gotra and were learned in the Yajur Veda. A brahmana called Sarvajna was seventh in the ascending geneological line of Rupa Gosvami and was known by the title “jagadguru”. He was a king as well as a learned scholar. His son, Aniruddha was also an acclaimed scholar. Aniruddha had two sons, Harihara and Rupesvara. While Rupesvara was knowledgable in the Vedic literatures, his brother became expert in weaponry and politics. When their father died, the kingdom was divided between the two sons. However, Harihara seized Rupesvara’s land by force and forced the family to migrate to Paurastyadesha. Rupesvara’s son, Padmanabha was spiritually and materially very successful. Padmanabha relocated his family to Nabahatta (Naihati) on the banks of the Ganges River. Padmanabha had eighteen daughters and five sons, the youngest son being Mukunda. In the course of time, Mukunda’s son, Kumaradeva, moved to Jessore. His sons were Santosha (Rupa), Amara (Sanatana) and Vallabha (Anupama). On the demise of Kumaradeva, the three sons moved to Sakurma, near the capital of Gaudadesha (Bengal) where they continued their studies. The three brothers studied the Nyaya-shastras (treatise on rhetoric) from the famous logician Vasudeva Sarvabhauma Bhattacharya and his brother Madhusudana Vidyavachaspati. They also studied Sanskrit, Arabic and Persian. Due to their noble characters and academic proficiency, Rupa and his elder brother Sanatana were later forced into government service by the Sultan of Bengal, Alauddin Hussein Shah (1493-1519) which led to their excommunication from Hindu society by the orthodox caste brahmanas of Gauda. Rupa became the Sultan’s chief secretary (dabir khas), while Sanatana became the state revenue minister (sakara mallika). Rupa and his brothers made their residence at the state capital of Ramakeli and it was here, in 1514, that they met Sri Caitanya Mahaprabhu for the first time. At that time all three brothers were employed as important ministers in the Mohammedan government of Bengal under Hussain Shah. Approaching the Lord humbly they prayed to Him to somehow rescue them for their bonded state. Lord Caitanya assured them that now they had surrendered to Krishna, they would soon be delivered and would be able to join His sankirtana movement. After some months both Rupa and Anupama were freed from service. Rupa loaded all his wealth onto two boats and left with his brother Anupama for their ancestral home at Fatiabad in Jessore, where they distributed it. They then sent two messengers to Puri in Orissa to get news of Caitanya Mahaprabhu’s plans. The messengers returned with the news that Mahaprabhu had already left Puri for Vrindavana. Rupa and Anupama immediately decided to go and they wrote a letter to Sanatana telling him of their plans and asking him to join them in Vrindavana. They also told him that they had left 10,000 gold coins in case he was in need of financial help. Later, when Sanatana was thrown into prison by the Sultan for disobedience, he used this money to bribe the jailer and escaped to Varanasi to meet there with Caitanya Mahaprabhu. On his return trip from Vrindavana, Caitanya Mahaprabhu stopped at the holy city of Prayaga (Allahabad). It was here that Rupa and Anupama met him for the second time. At the historic Dasasvamedha Ghat, Sri Caitanya imparted confidential instructions to Rupa Gosvami and explained in detail all the fundamental principles of the doctrine of Gaudiya Vaishnavism. (2) to write and preach Gaudiya Vaishnava theology. He then sent Rupa Gosvami to Vrindavana to carry out these tasks. Rupa Gosvami first arrived in Vrindavana along with his elder brother Sanatana Gosvami in the year 1516, after receiving the direct order of Lord Caitanya. 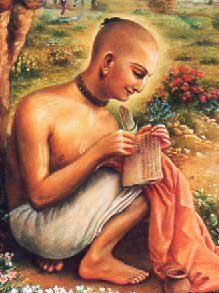 Through his writings Srila Rupa Gosvami chalked out the perfect spiritual path for all the followers of Lord Caitanya down through the ages. It was Rupa Gosvami who more than anyone else, firmly established the sankirtana movement of Lord Caitanya. He wrote a large number of important books on the science of bhakti-yoga and after the disappearance of Lord Caitanya in 1534, Rupa became the undisputed leader of all the Gaudiya Vaishnavas in the world. Even today all Gaudiya Vaishnavas are known as Rupanugas, or followers of Srila Rupa Goswami. After spending some time in Vrindavana, Rupa and Anupama left to visit Lord Caitanya in Puri. It is believed that on this long and arduous journey Anupama left his body. On his way to Puri, Rupa Gosvami started to write a drama about Lord Krishna’s pastimes in Vrindavana and Dwaraka. On arrival at a village named Satyabhamapur in Orissa, he had a dream wherein a beautiful woman appeared before him and asked him to write a separate drama about her. When Rupa awoke the next morning he realized that she was Lord Krishna’s most possessive queen, Satyabhama, and decided to write a separate drama about the Lord’s Dwaraka leela. On Rupa’s arrival at Jagannatha Puri, he met Lord Caitanya and showed the Lord the outline of his two dramas. The Lord confirmed that writing two dramas mixing the lilas of Vrindavana and Dwaraka was not proper as their was a vast difference between them. In Vrindavana the Lord enjoys the parakiya-rasa, where as in Dwaraka He enjoys the Swakiya-rasa. Lord Caitanya as well as Ramananda Raya were delighted to read the early drafts of these two dramas, which were eventually called Vidagdha Madhava and Lalita Madhava respectively. These two works are considered by Gaudiya Vaishnavas to be the most important dramatic literatures in the Sanskrit language. Rupa Gosvami stayed ten months in Puri and received further instructions on devotional service from Lord Caitanya. The Lord then asked Rupa to return to Vrindavana and complete the task of rediscovering the lost holy places of Lord Krishna’s pastimes. On returning to Vrindavana, Rupa Gosvami discovered at Brahma Kunda the Deity of Vrinda Devi, from whom the town of Vrindavana gets its name. This Deity was later moved to Kamyavana. Rupa Gosvami then discovered the famous Govindev ji Deity and immediately established Lord Govindaji’s worship on a grand scale. On hearing the good news of Rupa’s progress, Lord Caitanya sent some of his best men to assist Rupa in serving the Deity of Govindaji and establishing the Lord’s mission in Vrindavana. Shortly Rupa and Sanatana Goswamis were joined by Raghunatha dasa Goswami, Gopal Bhatta Goswami, Raghunatha Bhatta Gosvami and Srila Jiva Goswami. These great personalities become famous as the six Goswamis of Vrindavana. Jiva Goswami, who was the son of Rupa’s brother Anupama, became the most important disciple of Rupa Goswami. He was born on 1493 and disappeared on the 1564, precisely on the 12th day of the bright fortnight of Sravan. He lived 22 years as a householder and 51 years in Vraja. When he left the body he was 73. Much more on Srila Rupa Gosvami in our Archive.